Impact100 Metro Denver Presents: "Sharpening Our Focus"
With keynote speaker, Lt. 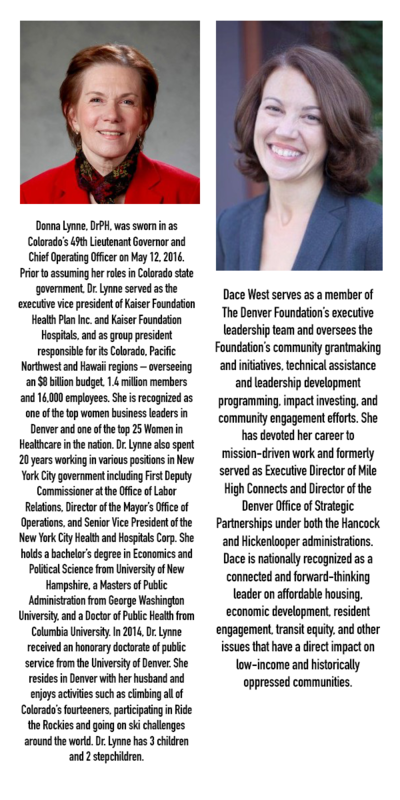 Governor Donna Lynne & local assets feature by The Denver Foundation Vice President, Dace West. Join us to learn from the most experienced and respected community leaders about Denver needs and focused attention being given to the recently-selected Impact100 four areas of focus. Plus, hear current updates and meet partners from nonprofits we've funded in the past! Join us for a light supper, beverages; displays/information from nonprofits Impact100 Metro Denver has funded & your chance to visit with representatives one-on-one! Learn from Colorado's Chief Operating Officer & direct questions to a knowledgeable foundation professional. All are welcome to this informative and celebratory evening, including members and non-members. Invite others whom you believe are aligned with the Impact100 Metro Denver mission of transformative community change.